Although the famous wild cats of India enchant most wildlife enthusiasts the world over, the dog family beats every other in my list of favourite mammals. India boasts of six species split into several races across the wide array of habitats and terrains that this magically diverse country offers. 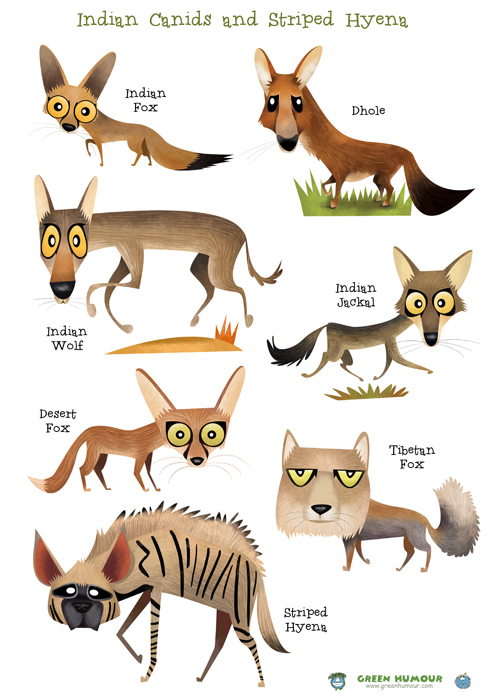 Ready to begin an Indian canid safari? Get set woof! 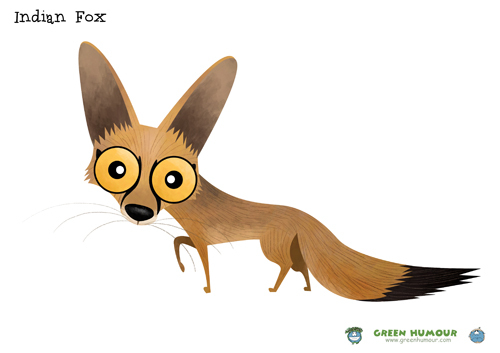 The Indian or the Bengal Fox is endemic to the sub-continent, and is the most widespread fox of the region. The black eye markings and the short muzzle give the fox an adorable appearance. The black-tipped tail is a useful field identification feature. An effective pest controller, the Indian fox feeds mostly on rodents. It inhabits scrubs and grasslands, and hence faces a threat from habitat loss and poaching, as most such areas lack legal protection. The Dhole or the Asiatic Wild Dog is a highly social animal, living in clans that may consist of as many as 40 animals. Their group hunting strategies also make them one of the most successful carnivores. Habitat loss and disease are the main conservation threats to the Dhole. As the name indicates, the Desert Fox dwells in the arid regions of North-West India. The white-tipped tail separates it from the Indian Fox. The desert Fox is a sub-species of the Red Fox, another race of which, the Himalayan Red Fox occurs in the higher Himalayas. The Jackal is the most successful member of the dog family in India, thriving in a wide range of habitats including forests, hills, marshes, grasslands and scrubs. Ever active and industrious, the jackal is a true opportunist. It scavenges on most occasions but actively hunts whatever it can catch, and has even been documented fishing! The jackal's opportunistic behaviour has earned it the reputation of a trickster in Indian folklore. Unlike the furry Gray Wolf of which this is a sub-species, the Indian Wolf is a thin, lanky-looking canine, nearly resembling a mongrel but larger in size. The Himalayan race of the Grey Wolf, called the Himalayan/ Tibetan Wolf differs from the Indian Wolf in having a luxuriant white coat. The wolf inhabits scrubs and open country in India where it preys on antelope. Increasing habitat loss and conflicts with cattle herders are the major threats that the wolf faces in India. Endemic to the Tibetan Plateau, the Tibetan Fox is a rare occurrence in India, found only in Ladakh and Sikkim where India shares her borders with Tibet. The most carnivorous of foxes, it is equipped with several adaptations suited to the harsh Tibetan terrain, that give it its unique appearance, such as a narrow muzzle, short legs and ears. The Tibetan Fox hunts pikas, marmots and hare. Although the hyena morphologically resembles dogs, it is phylogenetically closer to cats and weasels. 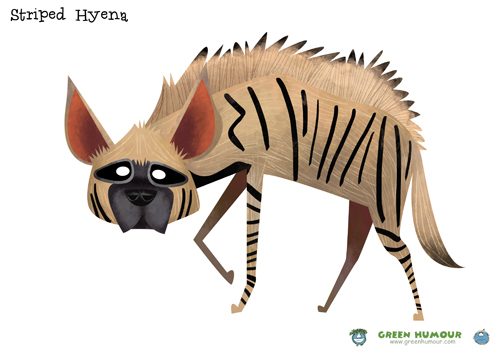 The Striped Hyena is the only hyena species occurring in India and is found across most of the subcontinent except coastal regions. Being strictly nocturnal, it is rarely encountered. Hyenas are primarily scavengers but larger animals are capable of taking prey down. As with most scavengers, it finds an unfavourable reputation in myths and folklore as a coward. Habitat loss threatens Striped Hyenas, and it is listed as Near-threatened on the IUCN. The compilation can be purchased as prints and a wide range of merchandise. For orders outside of India, please visit online store here.